I wanted to add a bit of autumn decorations to my son’s room, and thought it would be perfect for him to help make them! The first thing I decided to make with him was a fall wreath. I already had everything on hand, so it was perfect! Start by cutting a hole in the paper plate, right in the center, to make a wreath shape. My son loved using the glue stick, so I had him apply the glue in a small area. Then choose a leave and have your child press it into the glue. Continue until the entire plate is covered. We hung ours on our son's bedroom wall. But they'd also make great fall gifts for family members or grandparents! Making Leaf Shaped Sun Catchers: A Great Toddler or Preschooler Craft! Just a few days ago, I saw a photo of a sun catcher on Instagram and thought it would be so much fun to make fall themed ones for my sons room. My son is still under 2, so I needed to make it easy enough for him to participate and enjoy it! For my son, I simply peeled off the back of the laminating paper and laid it on the floor. I gave him the tissue paper squares and showed him how to stick them on. So he stuck all of them to the sheet, covering almost all of it. Once you’ve stuck your tissue paper in, grab another laminating sheet. Peel off the backing and lay it directly on top of the tissue paper side of the first sheet. Smooth it down as you go. 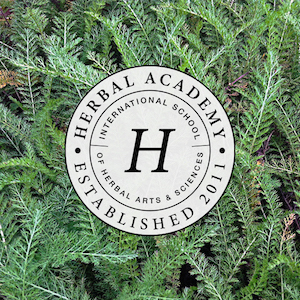 We wanted to cut ours in the shape of leaves. You can freehand this, but I ended up making a leaf template to trace because I don’t have a super steady hand. I just googled leaf template for that and printed them out. I traced around the leaves, then my son helped me to cut them out. Tie a string around the stem of each leaf (I also secured it with a piece of clear tape to make it hold up to my toddler). You can arrange them individually or in a garland across your window. There are SO many fun things to do with kids during fall. I am absolutely loving spending this time with my son. Here are some of our favorite fall activities, as well as a few we still need to try! We are actually heading out to the corn maze today - a first for my son. I know he's going to love it! What is your favorite fall activity to do as a family? Tell us in the comments! As I previously updated, we have been trying for a second child about 7 months now. During that time, I’ve had two chemical pregnancies, which has been disappointing, but not surprising. If you’ve dealt with infertility or recurrent miscarriage, I’m sure you’ve heard the same stories I have. That sometimes pregnancy is a “reset button” for your body. That couples who struggled for years to conceive their first suddenly have no problems and go on to have multiple natural pregnancies. 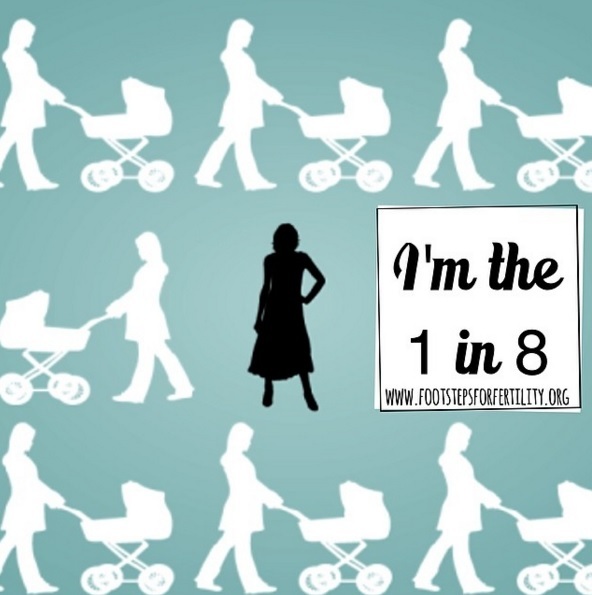 That couples who had multiple miscarriages never have another. My favorite versions of these stories are when the couple goes in to see their doctor to talk about fertility treatments for another child, when surprise! They find out they were pregnant and didn’t even know it. I have been told these stories... a lot. Many, many times. Every single person I know seems to have a friend who has gone through years of infertility... to then suddenly be cured after their first pregnancy. I think many of us who have struggled to have our first child have always secretly both rolled our eyes at these stories, while also praying that it happens to us too. I know I have. When I hear these stories, I always get a strange mix of hopefulness and annoyance. I did really truly hope that I would be one of those stories. But after having two chemical pregnancies over the last few months, I feel that what ever issue that caused our initial problem is still there. I have had a total of five chemical pregnancies now. But we have never gotten to the root of our infertility problem. I am planning to do more testing once we decide to start fertility treatments again. But until then we are going to continue trying naturally... and try to keep hoping. 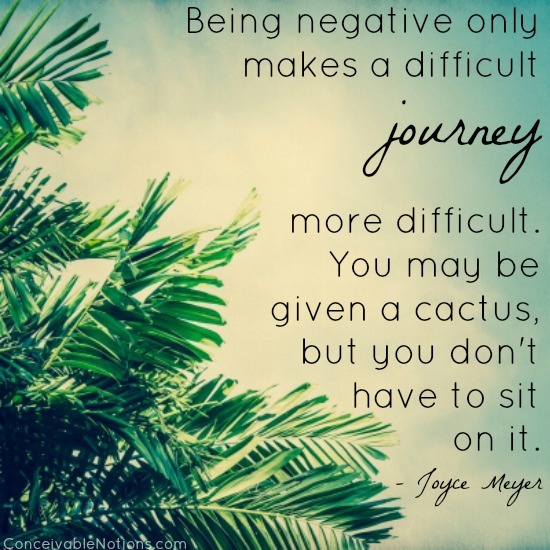 The first month we began trying again, I was stunned to have a positive pregnancy test. Absolutely stunned. But in my heart, I just felt something... like I knew it wouldn’t stick. I was right. Although I was sad and disappointed to have had another loss... I was also happy that we *had* gotten pregnant naturally. At that time, I had only gotten pregnant naturally once. So even though it made me sad, it did give me some hope. A few months later, I had a positive again. But this time, it felt real to me. I had it appear on two different brands right away. It appeared to be darkening properly at first. I let myself believe it was real. I even looked up what date the due date would have been. I started thinking of how I’d like to tell my husband and my parents. We were having a family get together in a few days. I was excited that it really might have happened. But... it ended as another chemical. Our fifth loss. I know something is wrong somewhere, even if all of our testing has been good. I think we’ll need to request more in-depth testing in the future and maybe someday we will get an answer as to why. Has anyone else dealt with multiple chemical pregnancies or early miscarriages? I’d love to hear your story in the comments! Firstly I want to apologize for not making an update about this sooner. 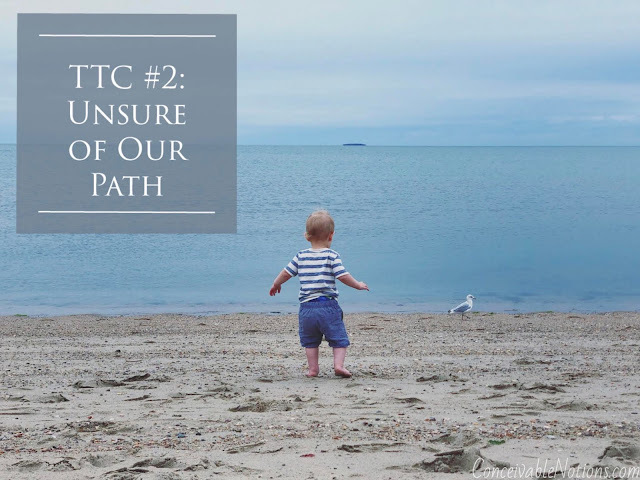 I have been feeling so conflicted about TTC #2, that I'm not even truly sure how to put my thoughts to words. We have always wanted 3+ kids. And we still do. But after my son was born, I feel differently about fertility treatments. I can’t fully explain, because I haven’t even been able to truly sort through my feelings just yet. But I’ll try to give an update and explain the best that I can. We started officially trying for #2 when my son was a year old. I wanted to be sure to make it to one year breastfeeding before trying, in case pregnancy impacted my milk supply. We are still happily nursing at 19 months old now, although not as often. I was and am unwilling to stop breastfeeding because I know I will regret stopping if I were to wean and not get pregnant. I may only be blessed with one child, so I don’t want to rush through these moments. Ideally, I'd like to wean when my son is ready and he begins the process on his own. There are still so many benefits to toddlers receiving breastmilk, which is why the WHO recommends breastfeeding until at least two years old. Strangely, I got a positive pregnancy test the first month we tried. Although it was a chemical pregnancy. I wasn’t surprised at all, because that was chemical pregnancy #4 for me. 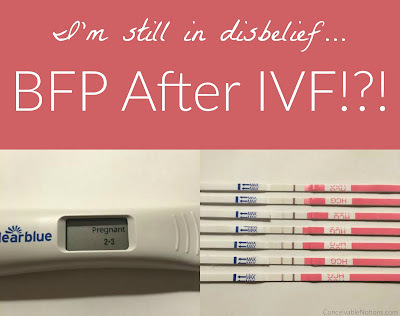 A few months later, I got another positive test, but another chemical pregnancy. So 5 total chemical pregnancies. We have never been able to explain why I have had these chemicals. Until we get some sort of diagnosis or explanation as to why these losses keep happening, I’m very hesitant to do any sort of expensive fertility treatment. There is some testing I’m hoping to pursue at some point, but I’m not sure if I’m ready yet. I'm still exploring what testing we would like to have before we make any decision to start fertility treatments. In our successful IVF cycle, we only had one blastocyst on day 5... which really scared me. We originally were planning a single embryo transfer and really wanted to reduce the chance of multiples. We would only transfer two if things didn’t look good and we needed to try to up our chances. All the other embryos were behind and really didn’t look great. We transferred one of those along with our only blastocyst. All the other embryos arrested and none were frozen. I feel like we were incredibly lucky to get a successful pregnancy when we only had one blastocyst. I’m *very* nervous that if we do IVF again, we will not be lucky again. We are also cash pay patients with no insurance coverage for fertility. When trying for our son, I would have spent anything - I wasn't concerned with the cost. But now that we have a child, I also struggle with the choice of spending so much on fertility treatments. If our cycle were to not be successful, I know I would feel guilty for having used that money, when it could pay for an entire year of college for my son. Realistically, I feel like I shouldn't look at it that way. But I can't help it. My heart aches to give our son a sibling. It’s a feeling I never knew I could feel so strongly. But I’m still not sure of our path right now. I’m hoping time will give us clarity. As for now, I am continuing to chart and we are trying naturally. I always have hope we may get a miracle! I have also been trying to learn to be "okay" with having no control over my fertility. I still struggle with how most other couples I know are able to easily plan their families and simply don't have these worries. But I am trying hard to embrace the uncertainty. It isn't easy and I fail all the time, but I am trying, and that is at least a start. 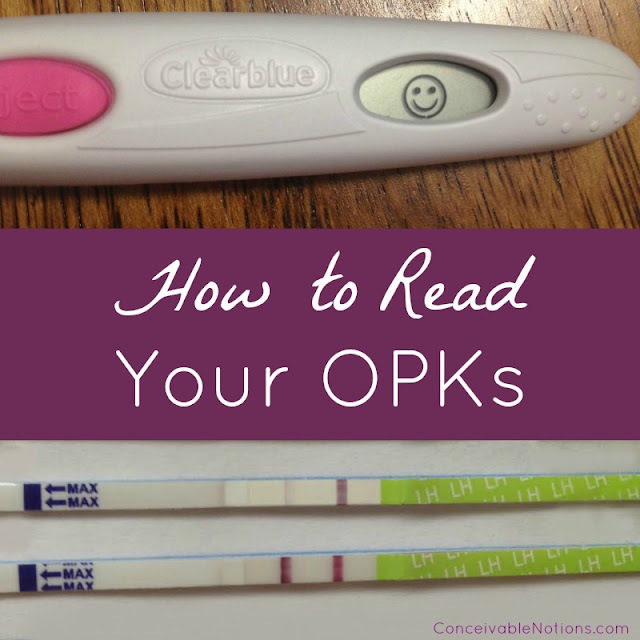 As someone who’s struggled with infertility, I have peed on *a lot* of pregnancy tests. Over the years, I have certainly developed a lot of opinions about different brands. I’ve found a few that I trust more than others, based on price, sensitivity, and past experiences with them. Pretty much everyone has heard of Wondfos, but there is another brand I prefer. Clinical guard has become the cheapie tests I always keep on hand. I used them all throughout my IUI cycles, testing my trigger out, and during IVF. And once I got pregnant, I tested with them quite a bit in an attempt to keep my anxiety in check. They really did an excellent job testing out my trigger, which showed me how sensitive they truly were. They come in larger quantities for anyone who has a reason to POAS often. It’s nice to know you aren’t wasting a ton of money with every test! OSOM tests are a little different because they use black dye, rather than pink or blue. It can make it much easier to see a light line because the dye is a darker color. These are the most sensitive tests I have ever used. But be cautious... you’re more likely to notice a chemical pregnancy with these tests. So if you would prefer to not know, wait a couple days and use a less sensitive test. Another thing to note is that with very light lines, it’s much easier to see them once the test has dried a little. One downside to OSOMs, is you need to buy them in a larger box. So overall they are cheaper than most drug store tests, but you have to spend more initially. I still always keep a box of these around! There’s a reason you see people immediately say “Go get a FRER!” anytime someone has a squinter on another brand. A First Response is the test we all are so used to seeing - it makes that line feel real for some reason! The downside is they can be pricey, so I only break out the FRER once I have a line on another test first. A friend told me the story of how she excitedly told her husband they were expecting baby #2. She had planned a really adorable way to tell him, involving their toddler. But when her husband saw the pregnancy test, he stopped smiling and said he didn’t see a line. Was she sure? He didn’t believe her! Browsing TTC forums, I have seen similar versions of this story multiple times. 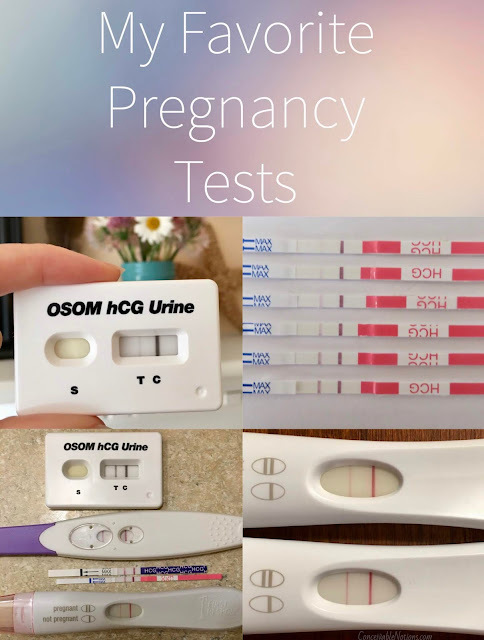 The digital test with the clear “Pregnant” is much easier for a husband to put faith in than a faint line! - Walmart’s 88 cent pregnancy tests - very sensitive and affordable! I’d buy these more, but I rarely go to Walmart. - Dollar Store Tests - again very affordable and surprisingly sensitive! - Easy At Home - I used these during our fertility treatment cycles and I was really surprised at how sensitive they were. It was nice having another affordable option that wasn’t just a cheapie test strip. - Wondfo - the classic cheapie! - Clear Blue - the most popular blue dye test! Anyone else have any favorite test brands? Share in the comments!